The hostel is very central, only 5 minutes from Brignole train station and 10 minutes walking to reach the historic centre. The property is also 2 minutes by walk from via San Vincenzo, Piazza Colombo and the Oriental Market. From here, you will be able to enjoy everything that Genova has to offer you whether it's a visit to the museum, enjoying a good Italian restaurant or watching the sunset in Boccadasse. While staying with us, we can guarantee you'll have more than one thing to put on your ''To do list''. 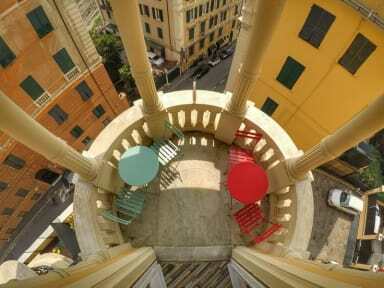 Victoria House is the new hostel of Genova located on the 3rd floor of a building built at the beginning of the 1900. The hostel has 5 rooms and we offer convenient mixed and private dorms. During your stay, you'll have access to a fully equipped kitchen where you can cook and a living room where you can relax, have coffee on our terrace or just chill on the couch while playing guitar with Valerio! Breakfast is also included every morning! In the end, if you stay at Victoria's, you'll not only leave as a guest... but as a new friend! Awesome hostel! Cool and friendly staff. Gave us a tour of the place and tips on things to do in Genova/nearby. Community vibe. Nice balcony. Breakfast provided. Laundry service available for cheap. Each room has designated bathroom. Definitely recommend! A fantastic hostel. Great staff and a very friendly and welcoming atmosphere. Close to Genova Brignole train station and a supermarket is just down the road. Staff are great, especially Antonio. Breakfast was free and one of the best yet. Beds are super clean and comfortable and most rooms have a sweet little balcony. 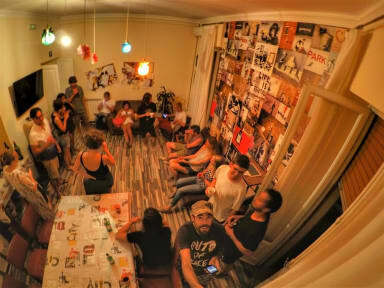 This has to be In my top 3 hostels in Europe, a must in Genova! It was a one night stay but the hostel was really nice and cozy. Staff was super nice and changed my room for a smaller one without charge. Breakfast was just ok but for the price you cannot ask for more. Comfortable rooms, plenty of bathrooms, friendly staff, pretty good location, especially for train transport to visit the local area and coast. I really liked the location of this hostel because it was close to the main train station. The staff was very helpful. The kitchen is small and rather crowded during dinner time which resulted in a wait time to use pots/pans- a minor inconvenience. Overall, I am really satisfied with my stay here! Lovely staff, very welcome and chill environment. A female friend and I stayed in mixed room and wouldn’t recommend that for girls — there was six men in the room with us, many much older. This is not a fault of the hostel, just try to book all female room if possible.